Samsung is largely expected to launch three variants of the Galaxy S10 next year. Renders for all the three variants has now leaked online, along with leaks of the protective film and a separate render of the Galaxy S10 Lite as well. The Samsung Galaxy S10 Lite is expected to be the cheapest variant of all, and the Galaxy S10+ is expected to be the most premium. All the three variants will sport the Infinity-O type display with the hole for selfie camera design. The Samsung Galaxy S10+ is expected to sport dual front cameras, whereas the other two to sport single cut outs up front. Olixar has already started selling protective cases and covers of the Samsung Galaxy S10. The MobileFun listings suggest that all the three variants will look the same up front – with the Galaxy S10 Lite sporting a 5.8-inch display, the Galaxy S10 sporting a 6.1-inch display, and the Galaxy S10+ sporting a 6.4-inch display. This listing was spotted by SamMobile first. The first two variants are seen to sport a triple camera setup at the back, while the Galaxy S10+ variant is seen to sport quad cameras at the back. There’s no rear fingerprint scanner in sight, so it’s either mounted on the side or underneath the display. The most premium variant is tipped to sport an ultrasonic fingerprint sensor, while the cheapest variant may mount it on the side edges. 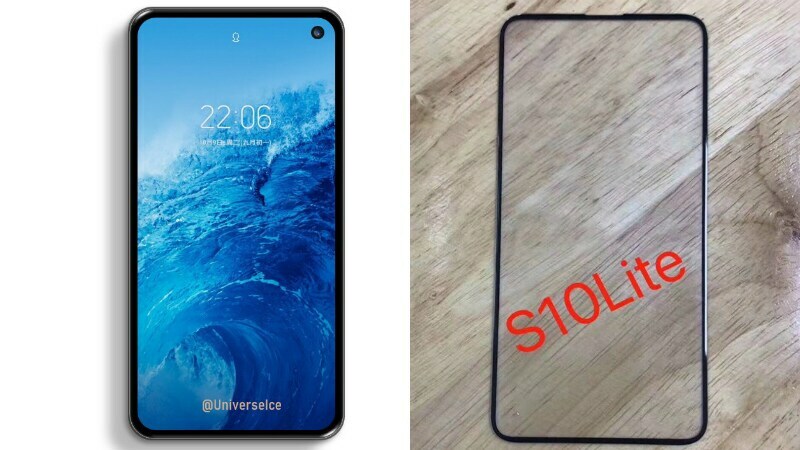 A separate leak, courtesy tipster Ice Universe, of the protective film confirms the front of the Galaxy S10 Lite. It reiterates the Infinity-O type display design, lending more weight to recent rumours. He has also published a concept render showing off the same front of the Galaxy S10 Lite as the Olixar listings. The tipster also notes that the Samsung Galaxy S10 Lite will sport a 5.8-inch 2K+ Super AMOLED display with 18.5:9 aspect ratio, the Samsung Galaxy S10 will sport a 6.1-inch 2K+ Super AMOLED display with 19:9 aspect ratio, and the Samsung Galaxy S10+ will sport a 6.4-inch 2K+ Super AMOLED display with 19:9 aspect ratio. Apart from the regular models, Samsung is currently in the news for developing a 10th-anniversary Galaxy S10 model that is codenamed “Beyond X” and is speculated to have 5G support as well as a total of six cameras. The new flagship is expected to arrive early next year.